AOA's Seolhyun is fine, but it was relatively close for an accident to happen. During a performance on a small stage, fireworks goes off very close to the group member's face, shocking Hyejeong. 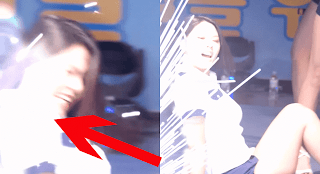 Seolhyun was lying down on the stage when fireworks all of the sudden exploded. She jumps with shock and turns her face away, shielding it the best she can. The camera pans to Hyejeong looking shocked and concern for her fellow group member. When she realizes Seolhyun is alright, she smiles reassuringly for fans.